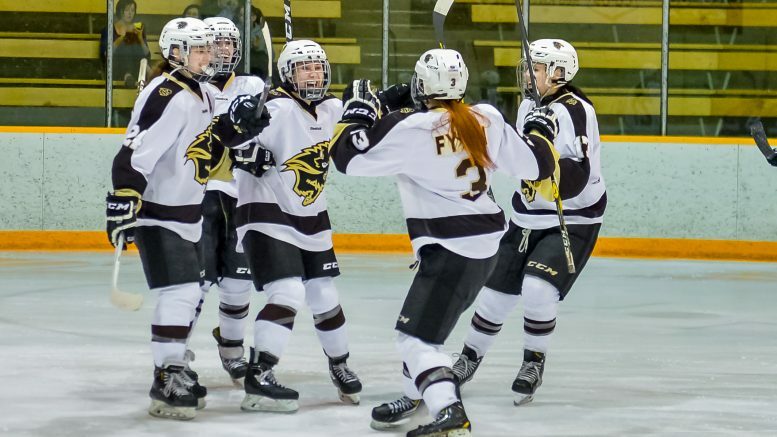 Manitoba stumbled at the final hurdle last weekend, falling in back-to-back games against the University of Alberta. They were back on the ice Friday night to start their first round series against the Mount Royal Cougars. The game was a tight-checking affair that the Bisons were able to win 5-1. The herd jumped out to a 1-0 lead early in the game. Defender Caitlin Fyten walked the blue line with the puck, putting a wrister towards the net where winger Venla Hovi was standing. Hovi got just enough of her stick on the puck to deflect it down and past Cougars goalie Emma Pincott. Mount Royal got a lucky bounce of their own in the second period to tie things up. Mairi Sorensen let a shot go from just inside the zone which bounced off the stick of Cougars centre Gabrielle Seper. The puck deflected past the foot of Bisons goalie Rachel Dyck to make it 1-1. Bisons centre Karissa Kirkup got her team back ahead a few minutes later following heavy Bison pressure. A crowd formed in front of the Cougars net and winger Jordyn Zacharias was able to get the puck to Kirkup who snapped home her first of the playoffs. Kirkup kept rolling in the third. She picked up a loose puck near the Cougars’ zone, entering alone and facing down four defenders. She stepped up and ripped a wrist shot low blocker on Pincott to push the Bisons lead to 3-1. The Bisons penalty kill shone at the other end of the ice, with winger Nicole Carswell picking up a shorthanded goal. She was the beneficiary of a nifty pass by Alanna Sharman who got the puck around a Cougars defender. The puck went cross-ice to Carswell and she tucked it five-hole to make it 4-1 Bisons. Manitoba defender Alexandra Anderson added the cherry on top with just over a minute to go. Moments after the Carswell goal she blasted a slap shot from the point past Pincott to ice the game. The game one win didn’t come easy for the Bisons, who relied on a superb penalty kill and strong showing from their goaltender. Rempel’s squad will attempt to get their penalty problems under control heading into game two tomorrow night. The team will be looking to book their ticket to the second round. Puck drop is 7:00 p.m. at Wayne Fleming Arena and if necessary game three is Sunday at 4:00 p.m.